Egg less Chocolate Cake made with Ragi flour and Wheat flour (sugarless). It is sweetened with Jaggery and Honey. 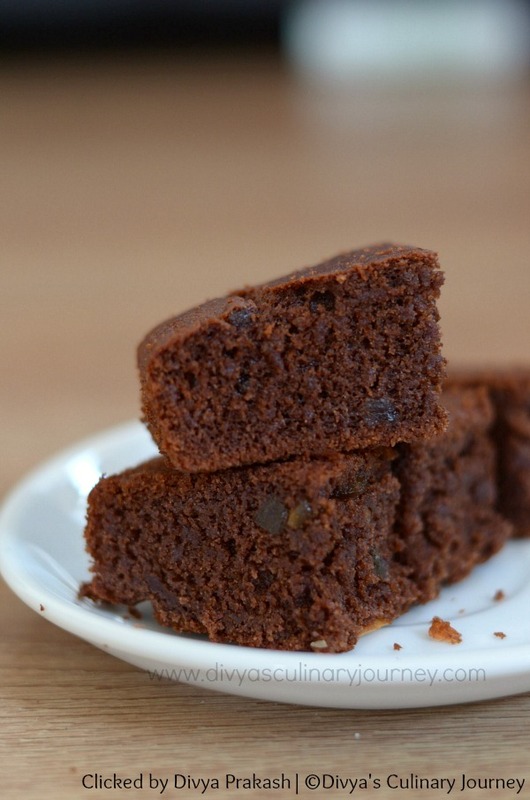 A Healthy guilt free Cake. Preheat the oven to 350F. Grease the pan and dust it with flour. In a bowl, sift both the flours, cocoa, salt, baking powder and baking soda together. In a bowl add grated jaggery and 1/4 cup of water and melt it. Don't bring it to boil. Then filter it for any impurities and let it cool slightly. In another bowl, mix all the wet ingredients together - yogurt, oil, honey, vanilla extract, milk and melted jaggery. Add the dry ingredients to this mixture and mix well until the cake batter is smooth. Finally add chopped nuts and dry fruits and mix well. Pour the batter into the prepared cake pan and bake for 25-30 minutes or until done (the tooth pick inserted in the center has to come out clean). Let the cake cool, remove it from the cake pan decorate as desired and enjoy it. Cake is not very sweet. So adjust the sweetness as per the personal taste. Baking time varies as per the size of the pan and also the oven. So check yours and bake accordingly. For the cake pan I used, it took only 25 minutes. I used 1/4 cup of dry fruits and 1/4 cup of nuts. If you prefer you can omit them. You can decorate the cake, as you please- may be with chocolate frosting or chocolate ganache. Sounds like a delicious and healthy cake. Ragi and jaggery in cake, this is the first time I'm hearing it. Love it, love it. Looks very nice. 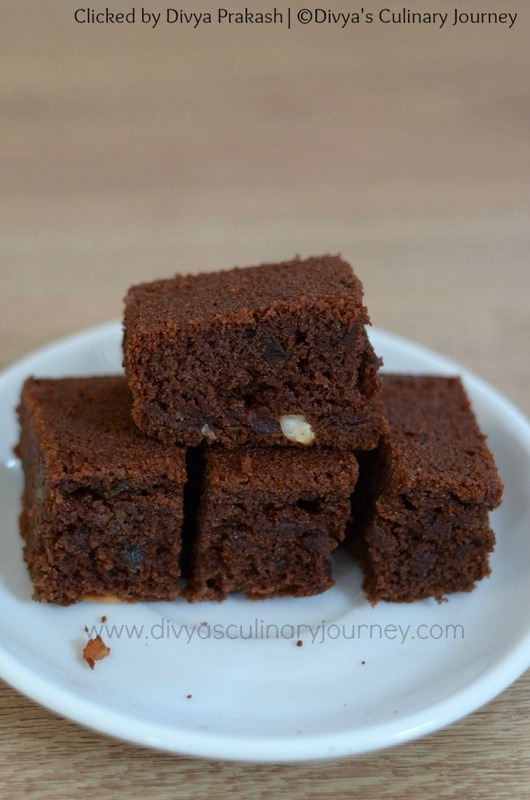 Very healthy, with ragi and jaggery, looks delicious..
welcome to blog-hop; this is a fine bake;with ragi in it the health quotient is also taken care of ! 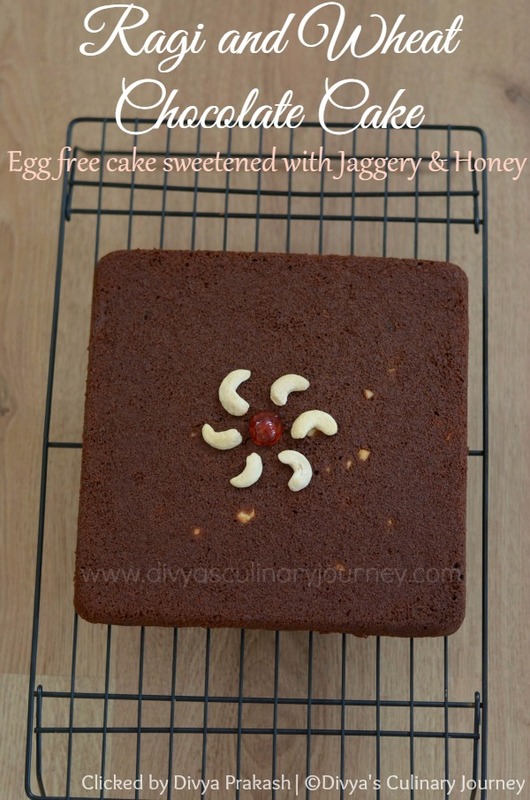 very interesting n wonderfully baked cake..
ragi and jaggery combo. woow.. it looks delicious!! Just wondering at what point did you add the honey? I have tried this recipe a couple of times with few variations each time, it is a very good and healthy recipe. Thanks! Thanks for the feed back and am glad you liked it. Adding powdered almonds might have made the batter thick. but that depends on how much you added. Also keep an eye on the time the cake is in the oven. If cake is over baked it might be dry as well. Thanks again and I really appreciate for taking time to give feedback. Wonderful recipe.. would defintly try this one.. am a sucker for such guilt free cakes..
Hi Divya, Thanks a ton for sharing this recipe. I have tried it twice and both the times it turned out perfect. My daughter was very apprehensive about this cake due to the presence on unusual items such as raagi and jaggery. But after eating it,she confessed that her judgement was wrong. Now both my kids insist that i make only this cake. really cant thank you enough.